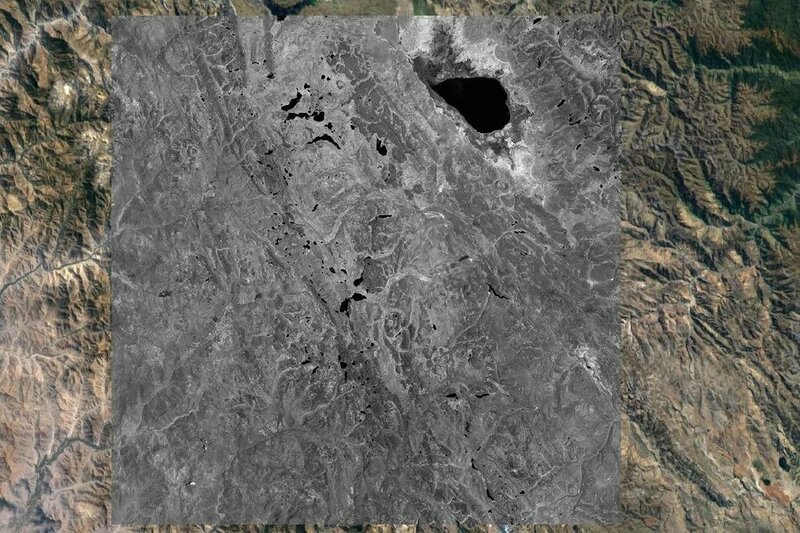 For this tutorial it is proposed to analyze the behavior of spectral signatures of satellite images of lagoons contaminated by mining waste. The study of the spectral signature shows the variation of the radiation reflected by the objects as a function of the wavelength, in this way it will allow to define the reflectance, which is a physical parameter that is associated with an inherent property of each material; that is, the fingerprint of a zone of interest. • Sources of contamination and dumping. • Exchange capacity of metals - soil, which is directly related to the content of organic matter and clay. 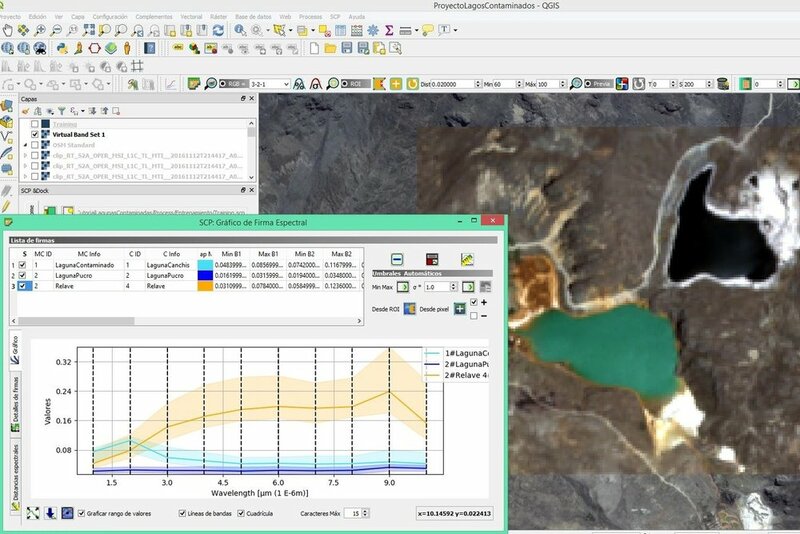 In this tutorial, the analysis of the behavior of spectral signatures in lagoons polluted by mining waste using QGIS 3 and the complement of Semi Automatic Classification (SCP) will be performed. The study area covers the Canchis and Pucro lagoons, the Canchis lagoon is the most affected, in the following image the contamination of its waters is observed by discharge of mining - metallurgical effluents from concentrator plants, it is observed that there are tailings fields nearby mines on the edge of the lagoon. The data of the study area were obtained from the Sentinel 2 server, where bands 2, 3, 4, 5, 6, 7, 8, 8A, 11 and 12 will be used. In the following image, the band 8 A is observed downloaded with a Google Satellite server background. 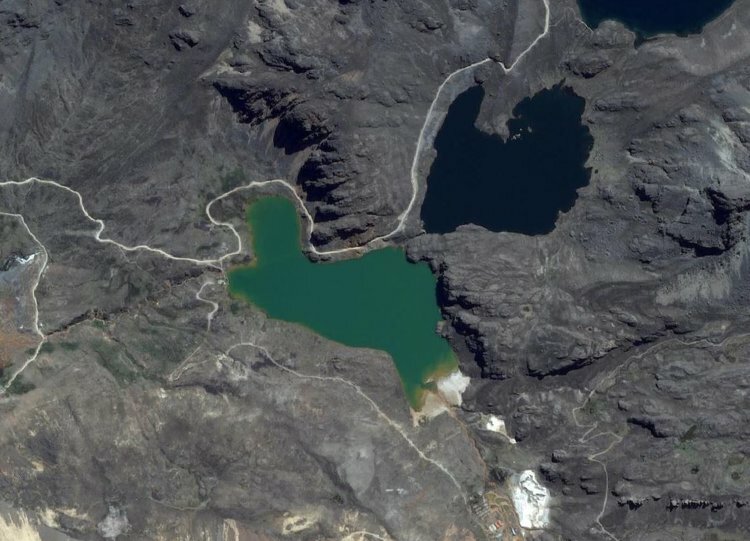 The satellite image data were preprocessed to provide a reflectance image of the area of interest that spans Laguna Canchis and Pucro, to associate the spectral signature and associate it with spectral signatures of some minerals for the purpose of analyzing them. The following image shows the composition in false color (right) and natural color (left) of the study area. The natural color image involves the visible bands, this combination allows to observe the details of water, whose spectral signature will be analyzed later. The false color / infrared image indicates the presence of vegetation, it can be identified that there is little vegetation, which corresponds to natural pastures. In the study area an orange coloration is observed in the soils near the Canchis lagoons, characteristic of the precipitation of metals, which could come from a natural contamination due to the melting of mineralized rocks in the upper part or by a drainage acid from rock or perhaps from anthropogenic contamination, such as mine drainage. The tonalities of the lagoons are observed as blue to black colors. The comparative analysis between the spectral signatures of the lagoons is carried out, in order to observe the spectral behavior. In the following image the spectral trace of the lagoons is observed. 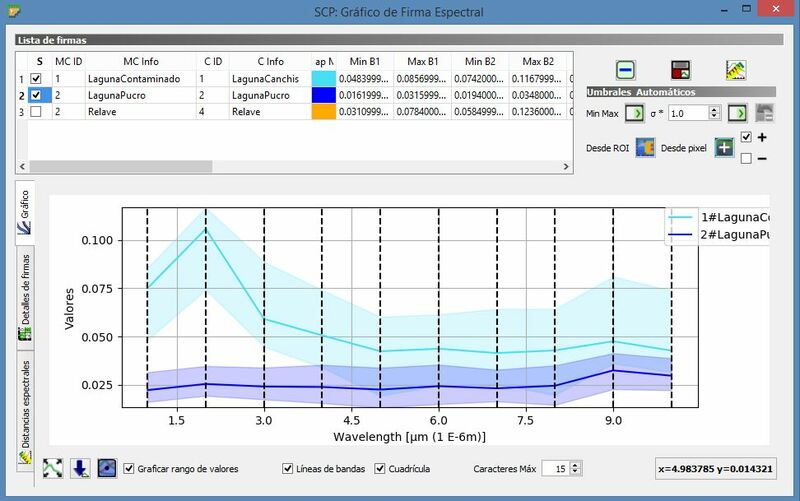 The Pucro lagoon presents a flat behavior, while the spectral signature of the Canchis lagoon presents a reflectivity in the green zone, due to the presence of materials in this case of metal contribution in the lagoon. There are reports that in the Canchis Lagoon mining liabilities (tailings and mouths) were found, which are a potential source of pollution of water resources and can be seen reflected in the emerald green coloration of the lagoon water mirror. A comparison has also been developed with the signature of the area with evidence of mining tailings to the Canchis lagoon, it is observed that the trend of the signature line is similar to the spectral behavior of a bare soil, showing high reflectivity with an upward curve along the length of the wave. The high reflectivities, in this case, are associated with cationic metal bonding processes. In 2012, the evaluation of physico - chemical parameters was carried out, where it was found that the waters of the lagoon are relatively acidic (pH = 4.7). Aluminum, cadmium and manganese due to the presence of mining liabilities that are located in the adjacent areas of the mine. Then we can conclude that remote sensing is of great importance to analyze spectral signatures in soil and water contamination by mining tailings.